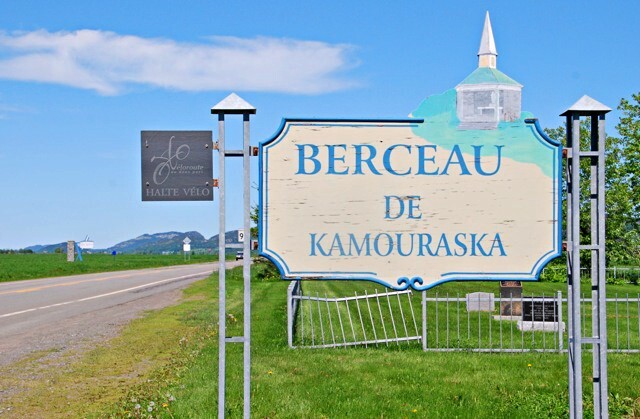 On the south shore of the St Lawrence River, about 400 km northeast of Montreal is the small town of Kamouraska where you can find this small memorial park. 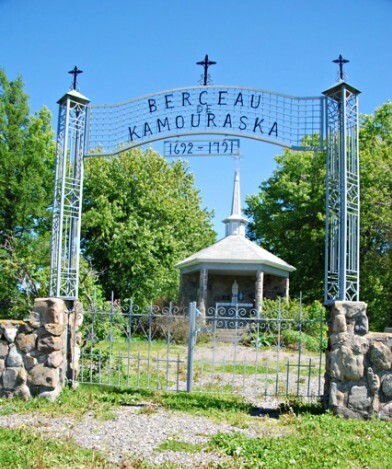 Since 1994, 300 years after the first settlers arrived, it has been recognized as a heritage site. 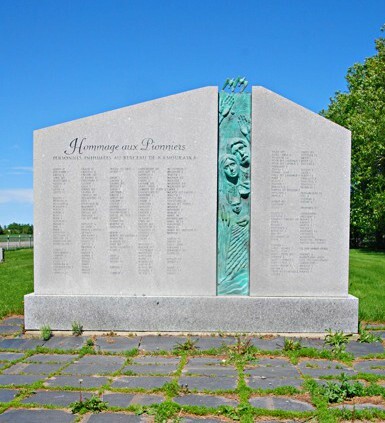 There is a monument dedicated to the early settlers with the names of 220 families. This seems extraordinary as there are less than 600 people living there now. I don't quite know how this works, but from the individual family gravestones many seem to have a 'family association' who have researched their genealogy and erected markers in homage to their ancestors. My family is quite small. I never knew my grandparents and the rest of my mother's family (which consisted of one sister and three cousins) are scattered around Scotland and England. 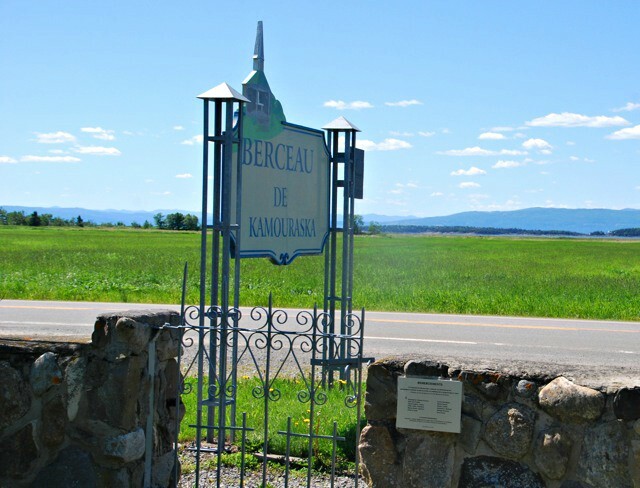 The Dionnes of Kamouraska had numerous descendants of the first three generations who lived here. I cannot imagine what that must be like. 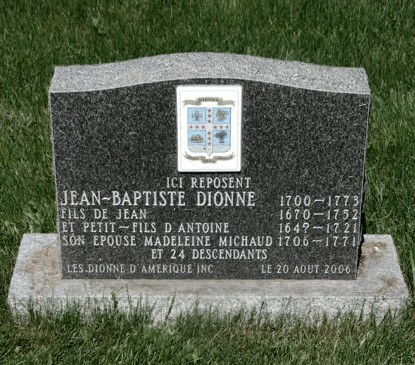 Grand-père Antoine and Grand-mère Catherine were married at ages 19 and 16, likely in France in 1660. They would have 12 children of which Jean would be their third born. Jean and his wife Marie-Charlotte would have eight children, with Jean-Baptiste being the second born. Jean-Baptiste and his wife, Marie-Madeleine would have nine children. Of all those 29 children, seven would die in infancy. There were too many cousins to continue counting. It seems to have been a common part of life at the time to have a series of haphazardly spelled names, (as I discovered when researching another grave post from this cemetery for Kerouac) and here, John Fraser, born in Inverness, Scotland, also went by the names Jean Le Gros and Jean-Baptiste Grosjean and even Jean Phraser and Jean Fraiser. 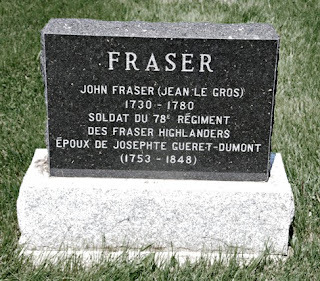 However he or his descendants (or the clerks who wrote it down) chose to spell it, John arrived here as a member of the 78th Fraser Highlanders during the Seven Years War. 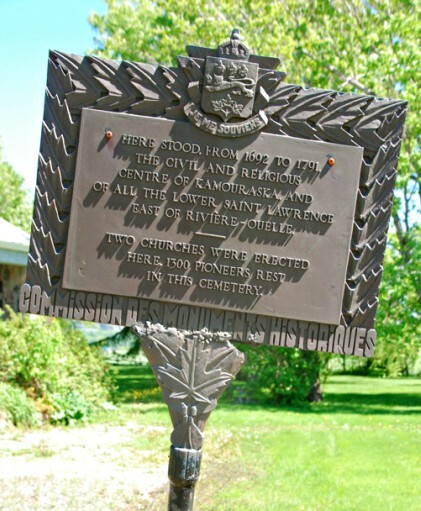 When they were disbanded in 1763 many of the soldiers chose to stay in Quebec. Jean/John would marry Marie-Josephe – aka Marie-Josette – Dumont on February 10th, 1777 when he was 47 years of age and Josette was 24 years of age. 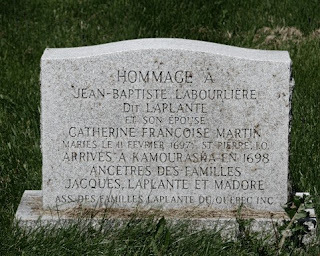 Things are a little murky on the genealogy site, but it seems there were two children born in 1777 – an Anastasie and a Jean-Baptiste (twins?). But, there's also listed a Pierre Fraser born 1772 (when Josette would have been 16) and a Jean-Michel Dumont whose father may or may not have been our John/Jean Fraser born 1771. Another daughter, Marie-Theotiste would be born in October of 1780, a mere two months before John/Jean died. The arch sign is a treat...great find. I'm glad i turned around to have a better look at it! It's an area rich in history. I managed to visit a few while on holiday. Desperately seeking the oldest gravestones...! Cemeteries are great places to do genealogical research. Grave markers use to contain more information than they do now. Sometimes they tell heart breaking stories. I haven't done this kind of post for quite awhile as it took up so much time, but I do really enjoy the research. Fascinating post. I love to wander cemeteries. So many untold stories. So many beautifully designed signs. An amazing place! This is a cradle indeed for the beginning of part of Canada's earliest days! Some cemeteries really can give a fascinating insight into the early life of an area. A wonderful glimpse into the history of the country. Thanks. There are thousands of little stories scattered around our ancient graveyards.